The concept behind this newsletter is that anyone with 15 minutes to spare can learn about the work of SATuRN. 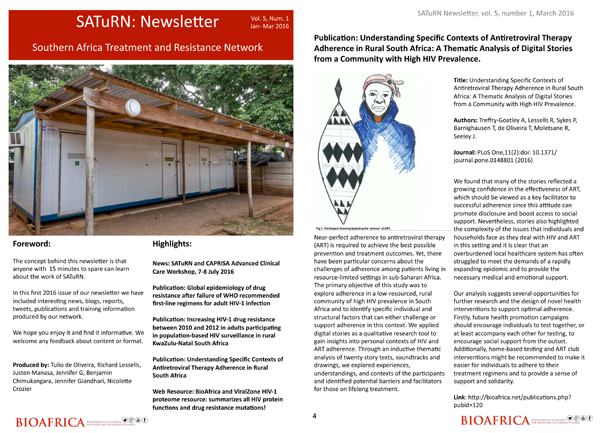 In this first 2016 issue of our newsletter we have included interesting news, blogs, reports, tweets, publications and training information produced by our network. We hope you enjoy it and find it informative. We welcome any feedback about content or format. - SATuRN and CAPRISA Advanced Clinical Care Workshop, 7-8 July 2016. - PUBLICATION Global epidemiology of drug resistance after failure of WHO recommended first-line regimens for adult HIV-1 infection. - Publication: Understanding Specific Contexts of Antiretroviral Therapy Adherence in Rural South Africa: A Thematic Analysis of Digital Stories from a Community with High HIV Prevalence. - Publication: Increasing HIV-1 drug resistance in adults participating in population-based HIV surveillance in rural KwaZulu-Natal South Africa. - Web Resource: BioAfrica and ViralZone HIV-1 proteome resource: summarizes all HIV protein functions and drug resistance mutations.